96 LEDs cast a safe, soft, mood-enhancing flame that puts off warm light, along with a natural dancing flame effect. Each LED flickers warm yellow lights, mimicking realistic and natural dancing flames. A safe alternative to the real “flames”. 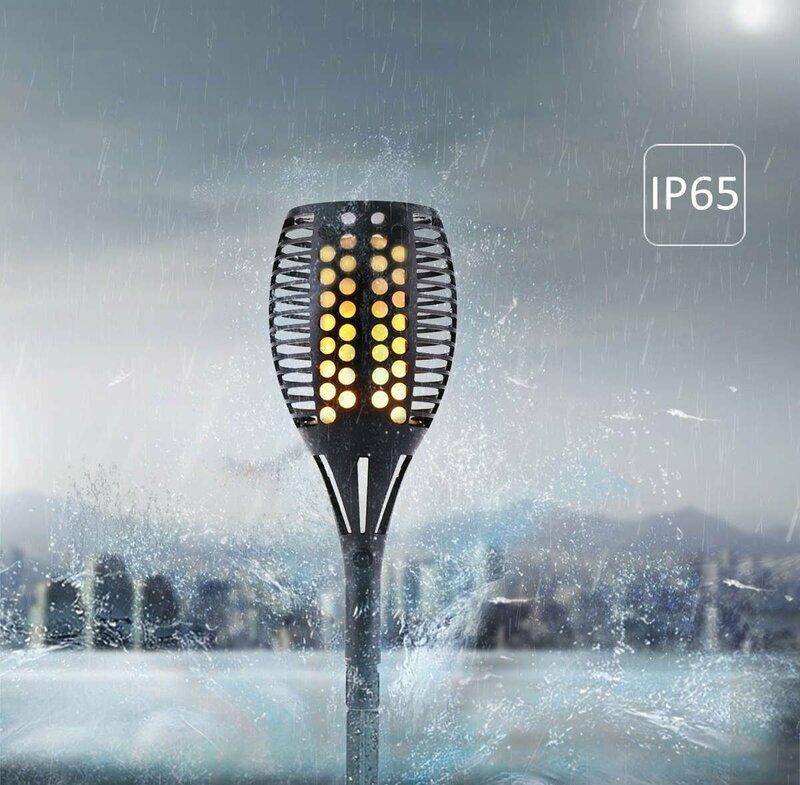 This light is waterproof (IP65), heatproof and durable, with solid hard plastic construction for withstanding years of sunshine, rain and snow. Great decorative landscape lights for outdoor events, parties, camping, bbq, wedding, Christmas and many other holidays. Use on your yard, pathways, pool, garden, patio, deck or beach. Add the prefect atmosphere to your place. Long Working Time - Built-in rechargeable Li-ion battery (2200mAh). Light up 10 hours in summer and 5 hours in winter after fully charged. Charging time: 4-8 hours. Eco-Friendly & Energy-Saving No electricity cost. Recharged by solar panel under sunlight. The path light with built-in light sensor. Press the on/off button to turn on the lighting system. Then it will turn on automatically at night and turn off automatically at sunrise. Bright your garden, pathway, or lawn. Make your garden much safer at night. Protect function: Over charging and discharging. Before the first use, please place the panel under the direct sunlight to charge for about 10 hours. I just bought my second set and I LOVE them!! Thanks for such an awesome product! I love this solar light. It's so realistic! With a sunny day it goes from sundown to almost sun up. The lights I️ put on my sons forever home, my son my Hero died from a cancerous brain cancer at the age of 20. The lights where stolen from my sons grave site. So real looking. Started with 2 now I have 8. I’ve had 3 neighbors asked were I got them. Worked great for 2 days. Love these. Came back and bought more. Very fire-like and can stay lit all night if they get a full days sun. Perfect Accent lighting for my backyard. Had to keep them back there out of fear that they would disappear from the front yard they are so nice! Thought I had an issue with one of the lights and the customer service team was great they sent me a replacement light right away. Will be ordering more this winter!! Very nice look, people walking by question if they're real torches or not. I was a little skeptical when I placed my order, but after reading the reviews I thought I would try them out. The quality is better than expected and I am delighted with the look in my backyard. I already have landscape lighting and these really add an atmosphere where they are around my pool! Extremely pleased and I will probably get more. I also need to give credit for the customer service I received. One of my boxes only had one light instead of two. I was not happy about that and contacted the company via email. I was astonished to get an almost immediate response, especially because it was on a Sunday evening. They scheduled UPS to pick up the box from my doorstep the next day and as soon as I confirmed pickup, a new box of two was on it's way! I never write reviews, but this product and service deserves it. These are awesome!!! I have them down my backyard pathway. So pretty!! These are TERRIFIC. They looked and worked as advertised. I love them and want more. We have 6 of them and they look so real that I was startled the next night fogetting they were out there, thinking it was a fire on my deck! Love these lights. I ordered 5, then 2 and about to order more as gifts. I was so pleasantly surprised by this. When I first saw it after dark I was blown away by the realism of the flame. I put it in the ground a couple of hours before dark and was surprised it worked that night and was still going strong before daylight.. Love, love, love it!!!! I love love love these lights. They look just like flame burning. When camping I get a lot of questions and compliments. I have 7 and ordering more. Not only do I love them, but all of my friends and neighbors love them too. No one believes they are solar because they look like a flickering flame! Beauty, quality at it's best. Highly recommend. Just like real torch flames. I installed them in my front yard. They look amazing! Just like the real torch flames, so beautiful! This is really what I want, love so much. Happy purchase, will buy more! These are so so cool. Looks like real fire. I made the mistake of posting a short video on Face book now all my friends are ordering and we won't be unique anymore :). They stay lit all night for us. Not sure if they will last the whole summer or not since we only had them two weeks but I am glad we got them. It look amazing in my garden. The solar light was nicely packaged and the thing that kind of surprised me the most is how light weight the item was.It definitely adds a lovely touch to the garden and makes it somewhat more lively. The light is really visible at night and it even keeps the foxes away as they think it is fire! It is multi functional. Overall I can definitely recommend this to anyone! Great product! I’ve bought 10 over the last year. The flame torches look so realistic and create a perfect ambiance in my back yard. Light lasts all night! Stakes break easily, so be careful. Otherwise excellent. Fast shipping! Good product, came promptly, still going just before the sun comes up! I love them. They look so real. Very bright also. I don't like that you cant get them on taller polls so I did modify mine to tall regular tiki torch polls I had and pushed the new ones into the old polls & tied them to the railing around my deck. I have a dozen. So cool! Love these tiki torches!! I have 24 of them on my property in Maui! these are very cool in our back yard. had a dinner party last night & everybody wants to order the. They were shipped out quickly and I love the way they look. It’s hard to believe they aren’t real. These are literally the best purchase I have made in 2017. They work great, go on and off as stated look like Real fire came on time. I love them! Even bought 6 more for my brother who loved them also. They are a bit pricey, but at least they are a great product and well worth the money. I am leaving them out this winter because they look so great! We will see if they are durable for all seasons! I bought eight of these lights and lined my paver walk with them. Last night had a Christmas party and all the guests remarked how they enjoyed the realistic flame. Will have to reposition the lights as the seasons change in order to receive adequate solar exposure. But for now amazed that some of the lights have come on these December dusks and have remained lit till 3-4 AM. Just a great product!! Will be ordering for Christmas gifts. We bought 4 for our pool area. Love, love, love them. Gives the tiki torch experience without the expense! Looks very real at night, I love the look. A little plastic feeling but works GREAT! Very realistic. We stuck some in planters in our driveway and they look great! Love these!! Quality is excellent and they look so real. I highly recommend them. The look great but already discarded 4 they seem not to hold up well at all. I love the lights on my front lawn area!! Loved them . Look like rolling flames from street . Might they come available in blue ? I'd buy a pair for sure . It's been cloudy in milwaukee area so no pic yet . These torches are awesome!!! What else can I say! I order 2 of the set luv them some much i order 4 more.Thank you so much for this item. These are terrific! No more messing with smelly oil, I love watching them light up in the twilight and burn through the night till the wee hours. Looks surprisingly realistic. I was surprised how real these looked. great product - works as described. thanks! 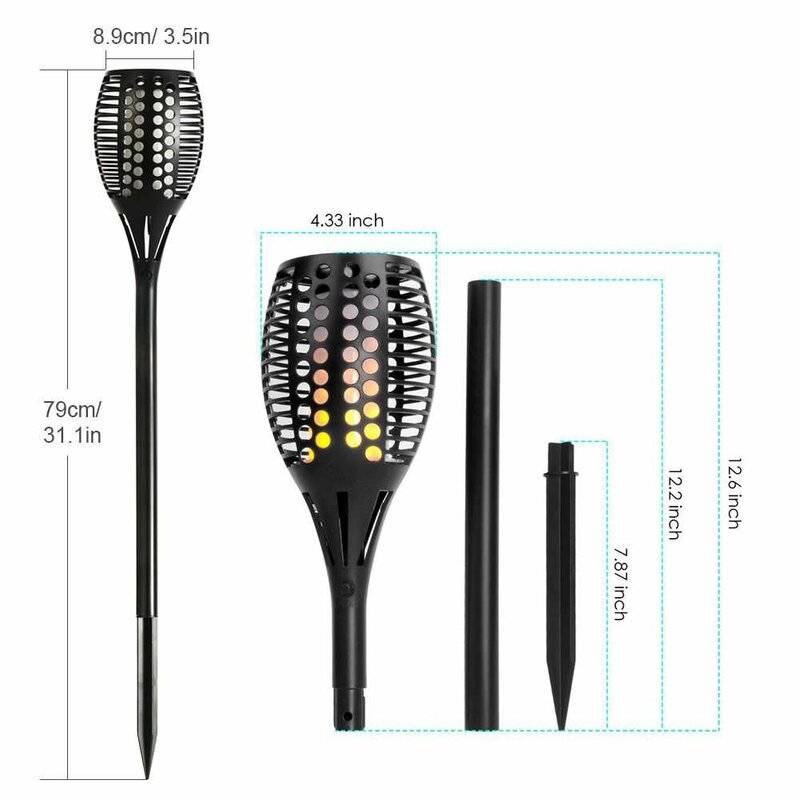 It's just what I was waiting for, terrific item, will order more. Absolutely awesome!! These lights look beautiful! Are longer stakes in the works? Got 6, and they are great, look very real , thinking about getting two more. We purchased the solar tiki torches for our boathouse. We loved the unusual look of fire and the length of time they stayed lit. So we ordered 2 more sets for a dry riverbed next to our house. Our neighbors want them! We are ordering another set for a birthday gift. Great design! absolutely love these - one of my best purchases. I originally bought 2 and loved them so much that I bought 2 more. They arrived quickly and are very easy to set up. They are so pretty when they are in action. Highly recommend! Works perfectly. The first set I think has different battery type in it they don't last as long as the second set I ordered. The second set I ordered stays lit until dawn ! They look really cool. I have 6 and will probably order more! Looks like a real flame! These lights are amazing. They are a great substitute for the real thing. These are amazing!! I ordered more!! These torches are AMAZING! Seem to be high quality. I sent one to my Mom who has ordered another set, and my sister did the same. Everyone is considering ordering another set. Very realistic flame! Hope they last as I'm hooked! I absolutely love these, I just wish they also had taller torches and hanging ones also. They look amazing! Well pleased with the appearance and quality of the product. Everyone that has seen them loves them!!! Works great, just as described. Gonna buy some more! We have 6 of these and they are so awesome and stay lit so long. This morning at 545am they were JUST going off from last night around 730pm. So realistic too!! I bought one to see how I would like it and once I got it and put it out, I ordered another. I would definitely recommend this product. I was very pleasantly surprised by the high quality and how realistic the flame effect actually is. I was also pleased to see a manual on/off switch as well as the photo sensor. My only wish is that there were options to make the pole longer but I'm sure I can figure something out for that. The best solar lights I have seen ! Love them ordering more !!! First I only ordered 2 and then my husband decided he wanted 4 more to put all around our patio, these are so beautiful at night. I looked out the kitchen window and startled myself thinking the deck was on fire forgetting I had these out there lol thats how realistic the flame is!! Beautiful lanterns with a very realistic flame. I would like them to be taller but they are well made, easy to set up and look just like the real thing. I am going to order more! The light is interesting, though it really doesn't put out a lot of light. It could use an extra extension so that it could be made taller, like five or six feet. Have special situations where as the lights will be used. May have them for 4th of July party. I thought these were kind of expensive, but glad I bought. The flame pattern is really realistic. If you factor in the cost for candle and tiki torch fuel they pay for themselves in no time! I love this lights, the arereally amazing! When I put this light in the dark, it will auto-lighting and last all night, I have never had any solar lights of this high quality before. I am so pleased and will for sure order more from them. 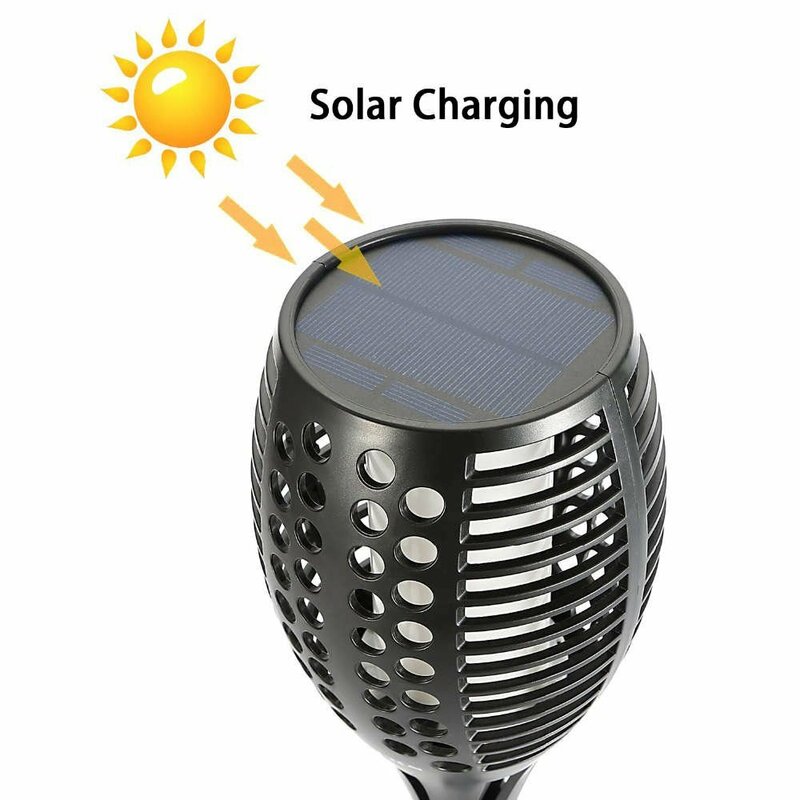 I purchased this solar light torch for the backyard grotto which is my new project. I'm so excited that I found this because it will save me so much time running corded lights then have to deal with the extensions and plugs. It is a perfect height as it approximately measure 31 inches high. I wanted to get my hands on one of these type of led fire emulators after watching a teardown of a led bulb that used a similar system. The flame led bulbs were for installing into light fixtures such as lamps. I found these type of lights very interesting because of the realistic dancing flame. When I found a solar version of this led bulb I was excited since it would be able to place it anywhere in the yard without needing to wire it. This is great since these type of lights would look nice outdoors since fire is oftenly associated to the outdoors. I am in love with this Zugo Solar Path Torch. With small children around it is difficult to find legitimate lighting like this that will not hurt the children. 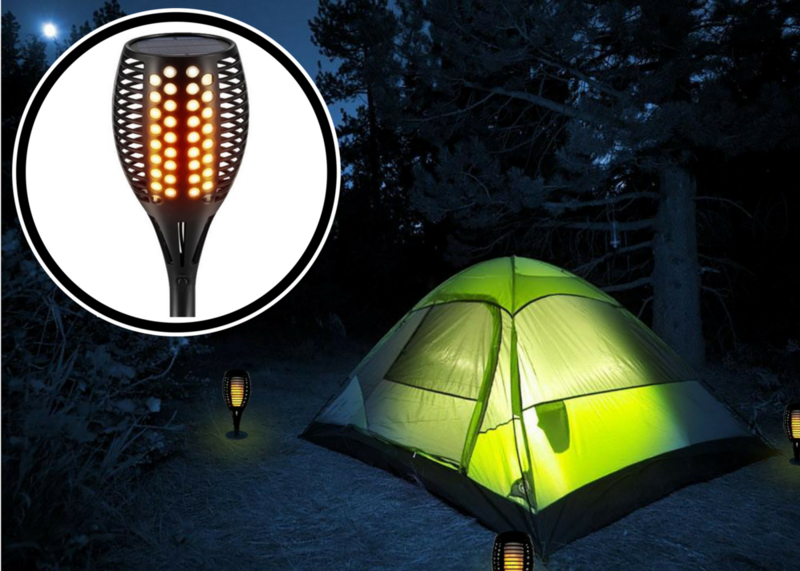 This has the same effect as a fire torch, only it is solar powered, and there is no flame. It has one switch. On/Off. It could not be simpler to put together and use. The stake could use a couple extra foot but for the price I am not complaining. Its been so bothering me that my front door is always so dark in the night when I went out to check mail. So My husband and I decided to get a pair of solar light to décor our front yard. So we are looking to get a modern look one. These solar light has nothing to do with electric, so you don't have to worry how to install and when to turn on/ off. These lights are very modern look, they look so beautiful in my yard. These things are really amazing! They look surprisingly realistic and run for hours! No one is going to mistake them for real flames when up close, but the "effect" of real flames is remarkable. The further you move back, the harder it is to tell they are "simulated". Will be buying more!